Despite the hot, humid temperatures, around 9,000 country music fans attended the 13th annual Cornstalk Fest on Friday and Saturday in Regal. "I feel it was a successful event," said Jerry Vlaminck, owner of the County Line Bar and Grill who hosted the event. "We had nice weather, very few problems, and lots of fun." The Kinleys, Ty Herndon, and the Nitty Gritty Dirt Band performed on Friday. 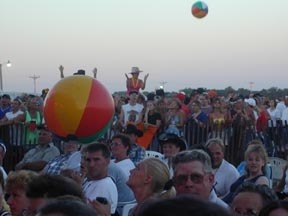 John Conlee, the Warren Brothers, Mindy McCready, and Mark Chesnutt performed on Saturday. On Saturday night, before Chesnutt's performance, Bob Brauchler provided a display of fireworks for the crowd. During Herndon's performance, he proudly mentioned he was the only performer that has been invited back a second time to Cornstalk. Of the eight performers scheduled to entertain, Clay Davidson was the only one unable to attend. On Thursday, his bus had an accident in Kansas, injuring the driver. "I tried to replace him, but was unable to get somebody on such short notice," said Vlaminck. Local bands performed music in his absence. Vlaminck said they had 600 campers on the grounds, 100 more than last year. The storms stayed away during the afternoon and evening performances. An extra 20- by 40-foot tent was erected to help shade people from the hot sun.